I’m finally getting around to reviewing The Hobbit: The Desolation of Smaug. Like An Unexpected Journey, I watched it twice, in two different cinemas over two days. First at The Odeon in Point Village and then in The Savoy on O’Connell Street. I went for the 3D version which was grand I suppose, the giant bumble bees were cool and there was one brief interaction with Smaug that really rocked. To date the only film I’ve watched that seemed genuinely enhanced by 3D had been ‘A Very Harold & Kumar 3D Christmas.’ Not really a ringing endorsement for the technology. Anyway, the film itself. Loved it. Could find no fault with it. Some wonderful action sequences and Smaug himself was everything one would want in a fire-breathing sociopathic behemoth. I dismissed the first movie as self-indulgent to the point of harming the franchise. Fortunately I’ve was proven utterly incorrect. That movie did great business, as has this one. While admitting I was wrong, I still am confident that this film is far superior to Unexpected Journey. Obviously as this is the second film there was a great deal less exposition required. The film didn’t have to bring nerd and non-nerd up to date, beyond a single scene recalling Gandalf’s first meeting with Thorin Oakenshield. We get to see elves, actual elves. Now these are Sylvan Elves. A race of elves more mercurial than their Eldar cousins, but still, Elves. Legolas was there. His father, the menacing King Thranduil was there. And we got to meet non-canon character, Tauriel. A she-elf who may or may not have caught the eye of our erstwhile Prince Legolas. It is wonderful to see elves, who while still immensely powerful, long-lived and intelligent, behave without the wisdom of the Eldar. They come across as more über-human than otherworldly. But hey, Elves. I think Tauriel fits seamlessly into the narrative. Not sure about the love-interest. Are they trying to ape the bromance of Gimli and Legolas from Lord of the Rings? Smaug was mind blowing, yet Bilbo managed to hold his own in the exchange and I mean that as a comment on performance rather than narrative. Martin Freeman could and should have been blown away (excuse the pun) by Benedict Cumberbatch’s Smaug. It is a wonderfully observed interaction. I described Martin Freeman’s Bilbo as a delight in my review of An Unexpected Journey. Here he is a delight and more. He brings a depth that tells a story about a character but also foreshadows so much of what is to come at the close of The Third Age. Gandalf goes wholly off reservation if one is totally hung up on the book. The film tells us what the book only implies and Tolkien later confirmed in the appendices and other sources. He abandons the group to investigate a new dark power. That is a confrontation worth the admission money alone. The dwarves are part heroic, part bumbling buffoons and many parts avaricious mercenaries, but they are never disloyal and never cowardly. (Watch out for the comic mention of Gimli from by father). Again Richard Armitage brings a tragic majesty to his Thorin. It is clear why this king of a lost kingdom (Aragornesque?) can inspire his fellow dwarves to battle a bloody fire-breathing dragon. In short I loved this film. I loved the previous one, but this one I’d defend to a non-Ringer. Roll on the final installment. Though after that, what’s left? I grew up in Lixnaw, which has a great deal of history. My parents’ house is 100 metres from where the Norman lords of Kerry had their castle. Thomas FitzMaurice was made Baron of Lixnaw and Kerry in the 13th Century. He founded the Franciscan Monastery in Ardfert. Where the castle once stood, are the ruins of the later FitzMaurices’ stately home. In that big house was born Arabella FitzMaurice-Denny, who founded the first Magdalene institution for ‘fallen’ women. She had a nephew who became a Prime Minister of Britain and gave his name to Landsowne Road Stadium. Go a hundred metres in the opposite direction and there’s Lixnaw’s GAA ground. I still remember the day the farmers of the parish arrived with tractors and trailers to draw soil dredged from the River Brick to the new pitch. On the day it opened Kerry played Limerick in hurling. I can’t remember who won, but I remember it was sunny. Hurling has always been the first love of Lixnaw. Three Lixnaw men, Maurice Kelly, John Murphy and Maurice FitzMaurice (great-grandfather to today’s county football manager, Eamon FitzMaurice) played on the side that won Kerry’s first ever All Ireland in 1891. It may seem strange to some that Kerry’s first win was in hurling, but the real irony is that the Lixnaw men played with our fiercest rivals, Ballyduff. A recent addition to the village is a Memorial Arch erected in memory of the Irish people who died in the Korean War. Close by is the convent school. It once included a secondary school and a school for people with learning disabilities. It’s where I cast my first vote. Next to the convent is St Michael’s Church, built in the 1865. I may not be a Roman Catholic, but I still have strong feelings about what churches should look like and they should look like St Michael’s. My old school is a short walk away. It looks much different from when I attended. It has been a nursery for many of Lixnaw’s hurlers these last few decades and it’s where I cast my most recent vote. One day, when I was in I think first class, we were drawn to the sound of a train going through the village. As far as I know it was the last ever train to go through Lixnaw. The railway station closed and it’s now a home. It has that Victorian architecture common to train stations all over Ireland. A pity I can’t walk from my house to a train station that could take me all the way to Dublin. The village also has its ‘ghost estate’; locked behind metal fencing, a piece of new history, our monument to failure. On the other side of the village is the Community Centre. I remember watching my uncle perched high on scaffolding as he helped to build it. Beyond that is one of Lixnaw’s bogs, where I sometimes helped my neighbours save turf. From there one can see the bridge over to Ballyduff. It’s the third bridge in my lifetime. Hopefully this one’ll last. Across the river is Rattoo Tower. A round tower built a millennium ago to protect against the ravaging Vikings, ancestors to the Normans. It’s an interesting experience, being able to see a thousand years from my window. There’s this thing that happens when an inspirational figure dies. First the person is elevated to a position above mere humanity, then there’s an unseemly fight for ownership of that person’s memory. When that fight is about someone as exceptional and brave and as young as Donal Walsh was, then things get very serious. That struggle over Donal Walsh is being waged on Twitter, Facebook, in chat-rooms and on blogs. It’s a war about how we should interpret the words and utilise the memory of Donal Walsh in our attempt to reduce suicide in this country. Unfortunately, suicide is a mental health issue that, like any other health problem, requires a lot of money to resolve. Donal Walsh wanted to save lives. He wanted to inspire his peers to choose life over death, a choice he was being denied himself. He reacted to a spate of ‘copy-cat suicides’ by issuing a message of such strength and integrity, that he gave some of his peers reason to pause. He may have saved lives, achieving in his short life more than many will ever achieve. For this his legacy should be assured. The trouble for me is the way his message has been taken up by the HSE and politicians. Worse, the media has failed to bring any level of investigative expertise to this issue and have allowed this purest hero to be used as a ‘poster-boy’ in what seems to me a cheap and inaccurate campaign against the scourge of depression and suicide. Donal Walsh spoke to those of his peers who may have recklessly chosen suicide as a solution to a short-term problem. He was not speaking to those who struggle with the long-term disease called depression. Depression is no great mystery. It’s a disease like any other. A certain percentage of the population will contract it. Some will have such mild symptoms, that they may cope without help. Others will need some intervention and yet more will need massive amounts of resources, over a long period of time, to save their lives. Like cancer, it requires money, money and more money to combat. Medication, residential care, long-term sick leave and talk therapy are all very expensive. They are not available to everyone. And even when they are available, a recent study showed that 60% of respondents would not hire someone with a history of mental illness. Try imagining everyone who contracted depression receiving the same level of care, support and admiration as we think someone with cancer deserves to get. It’s a pipe-dream because depression is a mental illness so it only merits sound-bytes, empty promises and damaging rhetoric about cheering up. This dismissal of the true nature of depression means the Department of Health, the HSE and our politicians are not implicated in the avoidable deaths of those with depression who take their own lives. That’s the horrible thing being done to Donal Walsh’s memory. He is being held up as an example to depression sufferers. They may as well be telling cancer sufferers, be as brave as Donal Walsh, just don’t expect to be looked after. Donal Walsh deserves better than that. Sufferers of depression deserve better than that. If our politicians want to address suicide, start spending and stop telling ill people to cheer up. There’s a long tradition of women taking their clothes off for a good cause. A thousand years ago Lady Godiva rode naked through town naked on a horse so her husband would reduce taxes. More recently there was that world famous calendar made by the Women’s Institute in Britain. They posed naked to raise money for cancer research. Today we have Kerry woman Aisling FitzGibbon using the same tactic to draw attention to her anti-fluoridation campaign. Her efforts haven’t going unnoticed. Water fluoridation was the subject of a Private Members Bill in the Dáil. It didn’t get anywhere, but some of our elected representatives spoke out against putting fluoride in our water. It may have been dismissed by the Government, but getting that far must still count as a remarkable success for the cause. I’m reluctant to draw further attention to this non-issue but it does raise an interesting topic; who do we trust to guide us when we don’t understand or don’t want to understand something? For thousands of years we trusted witch-doctors and priests to make sense of all the things that confused or scared us, be it death, disease, the weather or other tribes. We knew how to hunt, gather, make rudimentary tools and find shelter. We left the serious thinking and the other worldly knowledge to a chosen few. Things haven’t changed a great deal since then. We still allow a chosen few to do the thinking for us. The only difference now, is that we’ve much more choice regarding who we trust. I’m not above this. I wish I was, but life’s too busy and distracting for me to carefully investigate every single decision I’m faced with on a daily basis. Most of my decisions then, eventually become matters of habit or instinct. I’d get nothing done otherwise. What about the less common decisions? Even they can become tiresome, but when they’re about our health we do try to make some sort of sense of the overwhelming amount of information available. What then do we do when faced by an earnest young woman, with a compelling story, who’s so convinced of her opinion that she has convinced many national politicians to join her cause? How do we handle the occasional scientist and study which kinda looks like they might sort of justify a fear of fluoride? Who has the time to do the required reading? Who do we trust to do our thinking for us? I trust that a scientist has two basic ways to claim something to be true. He or she must create an experiment that proves what they claim. Then they must publish the details of that experiment. If other scientists can’t replicate the results, then it’s back to the drawing board. Or they can assemble a huge amount of statistics and then after refining all the data, according to strict and transparent rules, they may venture some verifiable conclusions. Thus far, no experiment nor any study has convinced me that the 0.7 parts per million of fluoride that’s in our water is anything but a cost-effective boost to public health. 3rd January 2014 / Paul W.S. 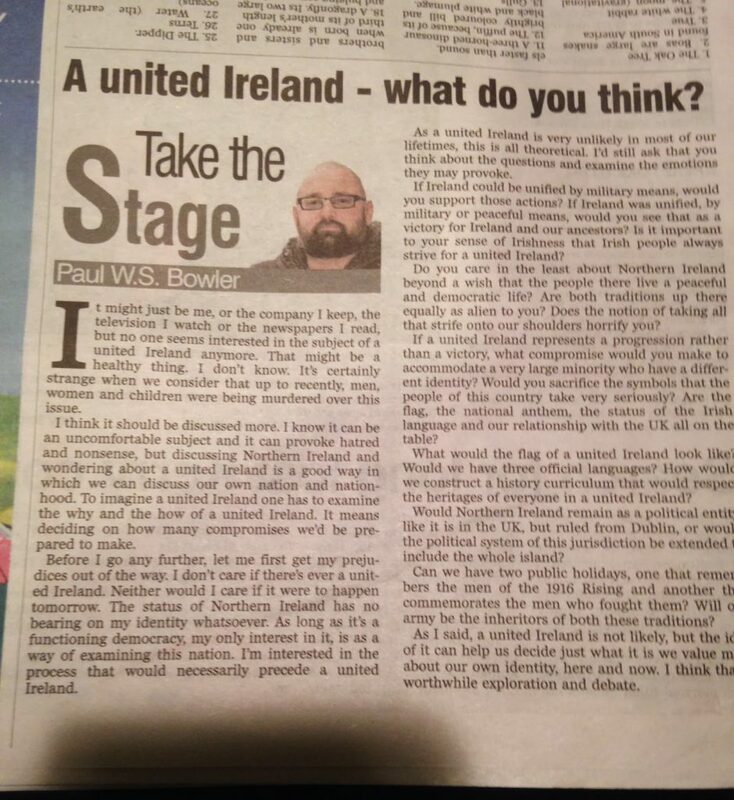 Bowler / Comments Off on Column: A united Ireland? It might just be me, or the company I keep, the television I watch or the newspapers I read, but no one seems interested in the subject of a united Ireland anymore. That might be a healthy thing. I don’t know. It’s certainly strange when we consider that up to recently, men, women and children were being murdered over this issue. I think it should be discussed more. I know it can be an uncomfortable subject and it can provoke hatred and nonsense, but discussing Northern Ireland and wondering about a united Ireland is a good way in which we can discuss our own nation and nationhood. To imagine a united Ireland one has to examine the why and the how of a united Ireland. It means deciding on how many compromises we’d be prepared to make. Before I go any further, let me first get my prejudices out of the way. I don’t care if there’s ever a united Ireland. Neither would I care if it was to happen tomorrow. The status of Northern Ireland has no bearing on my identity whatsoever. As long as it’s a functioning democracy, my only interest in it, is as a way of examining this nation. I’m interested in the process that would necessarily precede a united Ireland. As a united Ireland is very unlikely in most of our lifetimes, this is all theoretical. I’d still ask that you think about the questions and examine the emotions they may provoke. If Ireland could be unified by military means, would you support those actions? If Ireland was unified, by military or peaceful means, would you see that as a victory for Ireland and our ancestors? Is it important to your sense of Irishness that Irish people always strive for a united Ireland? Do you care in the least about Northern Ireland beyond a wish that the people there live a peaceful and democratic life? Are both traditions up there equally as alien to you? Does the notion of taking all that strife onto our shoulders horrify you? If a united Ireland represents a progression rather than a victory, what compromise would you make to accommodate a very large minority who have a different identity? Would you sacrifice the symbols that the people of this country take very seriously? Are the flag, the national anthem, the status of the Irish language and our relationship with the UK all on the table? What would the flag of a united Ireland look like? Would we have three official languages? How would we construct a history curriculum that would respect the heritages of everyone in a united Ireland? Would Northern Ireland remain as a political entity, like it is in the UK, but ruled from Dublin or would the political system of this jurisdiction be extended to include the whole island? Can we have two public holidays, one that remembers the men of the 1916 Rising and another that commemorates the men who fought them? Will our army be the inheritors of both these traditions? As I said, a united Ireland is not likely, but the idea of it can help us decide just what it is we value most about our own identity, here and now. I think that a worthwhile exploration and debate.